This will be our first VMBC Portland meet and we will be there all day Friday. Looking forward to our first “Portland”! While Friday is a good day to attend our meet and it is our first official opening day, we don’t have any club events going on that day. Friday is more of a setup day and day in which to get to know your camping neighbors and such. The gate will likely point you to the race track for parking. This year you will want to park on the track as it is probably the only dry parking on the grounds. Even though Friday is a setup day you will still have more stuff to look at than you will likely get to, and oh the food! That day will not have any club registration which you would be able to do so on Saturday if you bare not currently members. However, you can still become a member at the gate for $30 which will include your free admittance into the show for the complete duration and also 4 club magazines. I believe you would will spend $4 per person to get into the gate if you are not a member. If you would show up on Saturday I would definitely register in the New Building at the entrance. In that building club merchandise can be purchased including T-shirts, stickers, buttons, and magazines from the past. That building will also be the one to pickup your free license plate along with letting the VMBC know that you are there. 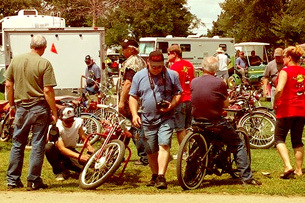 Also on Saturday you would see show bikes start to show up in the Big green 4-H building where a variety of vintage machines will be on display throughout the meet. When is the Fall show. I attended last year and me some fine people. Less than 35 vendors last year but still a fun time. Is it going to be the weekend after Labor Day?